We were recently delighted to add a seventh Stannah lift to our favourite UK visitor attraction – Brunel’s SS Great Britain. This time the lift is in the NEW ‘Being Brunel’ museum that aims to inspire budding engineers to follow in the footsteps of Isambard Kingdom Brunel. 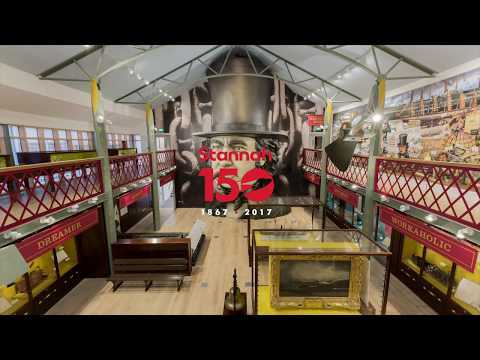 In addition to the museum that houses never-before-seen artefacts, visitors can experience Brunel’s original offices just as they were in the 1800s. The latest installation is a Stannah Piccolo lift, particularly suited to its situation between the brand new and old listed buildings in a limited space and providing access to both parts of the Brunel story. The five person, fully automatic lift has a generous platform so it can be used by wheelchair users independently and the lift’s traditional sliding doors allows maximum space for entry and exit on both floors of the museum. The lift is wall mounted within the new section of the building, its stainless steel and light grey finish complimenting the aesthetics of the stairs and landing areas and contrasting with the colourful, decorative interior of the fascinating museum. Stannah’s association with the SS Great Britain is not just about installing and maintaining lifts at the site. With our shared roots in Victorian engineering and our shared passion for encouraging young engineers of the future we are proud to facilitate accessibility in every area of the site, including the challenges of getting around the ship itself. Stepping back in time to imagine ‘Being Brunel’ is not only a celebration of I K Brunel but also a springboard of inspiration and opportunity for Britain’s emerging young ‘STEM’ (Science, Technology, Engineering and Maths) students in ‘The Year of Engineering 2018’. The Future Brunels programme aims to inspire and enthuse young people with science, technology, engineering and maths (STEM) throughout their time in secondary school, working closely with industry. The Joseph Stannah Foundation promotes STEM careers via STEM ambassador employees, sponsors Arkwright Scholars through university and invests in engineering apprenticeships. The SS Great Britain is a pioneering, 19th-century passenger steamship designed by British civil engineer, Isambard Kingdom Brunel, for the Great Western Steamship Company’s transatlantic service between Bristol and New York. It was launched in the presence of Prince Albert in 1843. In 1970 the ship was returned to Bristol following a salvage operation. The ship had been scuttled in a bay off the Falkland Islands and the passion of many enthusiasts brought the ship back to her original dock and then restored her to her former glory, beginning the ongoing process of preserving the ship and making her accessible to the public. Built from iron with a height, from keel to main deck, of 32’ 6” (9.91m), the logistics of helping mobility compromised visitors navigate three decks posed a unique challenge for Stannah Lifts as, amongst many considerations, access had to be made through the centre of the ship, and through a glass plate into the Dry Dock below. 2-stop Midilift on the quay at water level. With Stannah’s assistance, over 200,000 annual visitors to this national treasure enjoy access to its cultural heritage. Location: Dockyard Museum, telling the story of the SS Great Britain, her voyages, her crew and her passengers. Access: over two floors to interactive information and artefacts. Visitors to Brunel’s SS Great Britain can also use the lift to reach the bridge that takes them on to the ship’s upper deck. Access: Through the ship (appearing to go through the funnel) to the promenade deck and lower decks for a fascinating look at how life might have been as a passenger on the ship, depending on your class or position in society. It’s a remarkable feat to offer wheelchair accessibility into all decks of a ship that was quite inaccessible when built! Caption: A platform with a very industrial finish: a nod of approval from IKB? Location: on the quay at water level. Access: Visitors travel down into the dry dock through a glass ‘sea’ or waterline plate that forms the roof of a giant dehumidification chamber. Covered by a layer of water, the plate creates the illusion of a ship afloat on calm waters. Location: David MacGregor Library, Brunel Institute. Access: Over two floors for Brunel Institute users, connecting the David MacGregor Library, next to the National Brunel Archive, the Foyle Reading Room, the Great Western Room and the Viridor Theatre. The Brunel Institute is home to the world’s finest collection of original Brunel sources, delivering inclusive and innovative learning programmes where the focus is Brunel, maritime history, archaeology, science and engineering. Access: Over two floors to the new exhibition area and the adjacent original Brunel offices where the ship was designed. Today you can look straight out on the ship in her dry dock in which she was originally built. Passenger lifts: We supply and install passenger lifts with capacity for 6 – 33 persons from our two product ranges – Maxilifts and Xtralifts. Your lift can be supplied wall-mounted or with its own FX structure to give you maximum design flexibility. Platform lifts: Our comprehensive range of Midilift and Piccolo lifts offer capacity for up to 5 people and a wealth of configurations to ensure you install the ideal lift for your building. Accessibility: All our lifts help to comply with the Equality Act, Part M and meet the latest industry standards for manufacture and installation. The Bristol Service branch is also a member of the SS Great Britain Being Brunel Corporate Club, in recognition of the excellent educational opportunities the Trust offers to young aspiring engineers.